"I hunt for Makuta, it is true, but I answer to no one." I have a better idea. Join me. Together, we have the power to decimate universes. We could rule all of reality." "Umarak, what is the answer to question 5?" "I ANSWER TO NO ONE!!!1!!" "I hate the jungle, it's sticky, full of bugs." -Takua, Bionicle Mask Of Light. The only time Takua is basically Anakin from Attack of the Clones. Am I the only one that thinks that this line souded a bit like a question (even though it wasn't supposed to be one) in the animations? "No matter what the future may bring, some things will never change. Like the courage, and daring of true heroes." I feel obligated to correct you. Tahu didn't say "THE POWER", he said "THAH POWAAAAAAAAAAAAAAAAAAAAAAAAAAAAAAAAAAAHHHHHHHHHHHHHHHHHHHHHHHHHHHHHHHHH!!!!!!!!!!!!!!!!!!!!!!!!!!!!!!!!!!!!!!!!!!!!!!!!!!!!!!!!!!!!". There are 1,000 ways to destroy you right now, and I promise 941 hurt. I actually didn't look that quote up, I did it from memory. Did I do it right? danger is the anvil on which trust is forged"
"Gathered friends, listen again to our tale...of the Bionicle." I have a better idea. Join me. Together, we have the power to decimate universes. We could dismiss all reality. " "I have a destiny to fulfill. One reason for being. 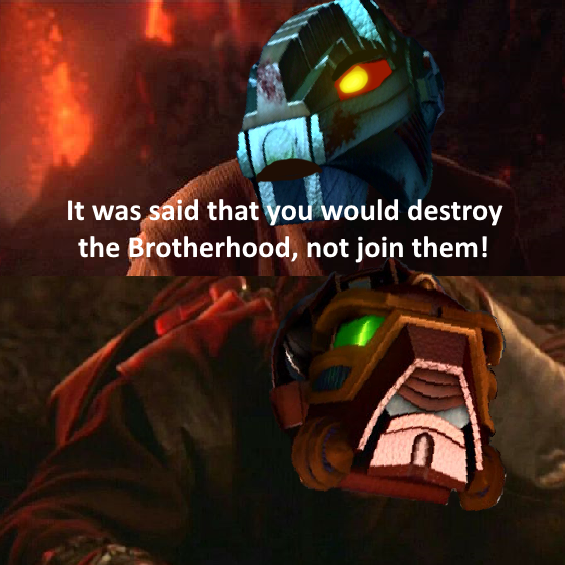 You have nothing, Makuta. You're nothing." Actually that whole dialog was pretty fantastic.